So many people have said to me this week 'I don't know how you do it' that today, it nearly became a self-fulfilling prophecy. I didn't know how I'd do it. Last Wednesday, sat at my desk, I scribbled down a week's worth of recipes to make sure that the Ocado man bought the majority of the things I'd need when he arrived on Thursday evening. Okay, so I jiggled things around a bit to make sure I had time to do the curd and the fancy meringue for the cake club cake, but I thought I was safe in the knowledge that there was a plan for today's recipe. On returning home, absolutely shattered and desperate for a quick win on the recipe front, I discovered that I'd written down 'something with vegetables'. I have no idea what I was thinking when I wrote that, but I only turned up one pepper which has gone mouldy and a couple of sad looking spring onions in my crisper. Along with four new potatoes and a bag of onions, it was hardly inspiring. I was worried that this might be the end of both the challenge and my sanity in my currently sleep-deprived state. Thankfully, Miss A saved the day by demanding to cook. 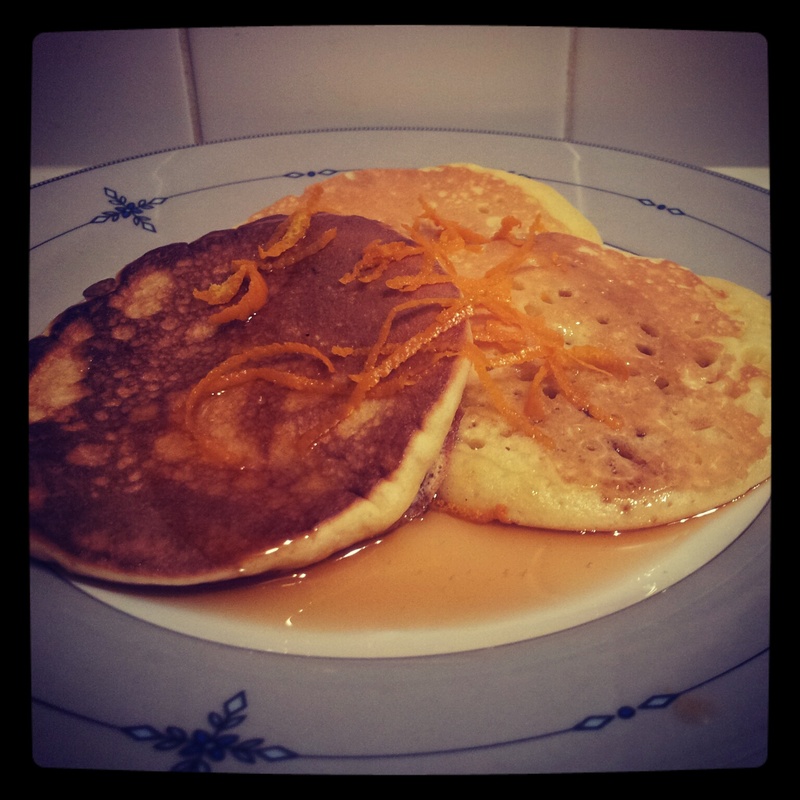 A quick flick through Mary Berry's 100 Cakes and Bakes turned up this recipe for Drop Scones. Now in my book, they're not really a cake or a bake. But hey, I'm not going to argue with Dame Mary. Miss A used to have Scotch pancakes for her breakfast every Saturday and Sunday when she first started weaning. Three small homemade pancakes, each with a slice of banana cooked into the middle for sweetness and then a pile of banana and strawberries on the side. Then the fussy phase hit and the pancakes were cast over the side of the highchair, dog-wards. I decided it wasn't worth the effort any more. Cheerios are now the breakfast of choice. So today gave me the ideal opportunity to re-introduce pancakes by letting us make them together now that she's big enough to stand on a chair and help out. Of course, she cracked the egg, but she also had a go at squeezing oranges and using my citrus reamer. All very messy and great fun. When it came to the cooking bit, she peered into the pan and announced 'No eat pancakes, Mummy!' Thankfully telling her that we'd feed them to the dogs soon changed her mind and she polished off three. The recipe is fairly standard. Flour, egg, sugar, milk and baking powder for the lift. You then add orange juice and zest to the batter for flavour. I will admit that I think it was probably lacking something to truly bring the flavour out - maybe a tiny pinch of salt or perhaps a splash of Orange Blossom Water. But all in all, a pleasant twist on a standard recipe. I'm sure they'd lend themselves to other citrus flavours too or to being served with a citrus butter or syrup. Or citrus curd. Now I'm typing I've realised they probably would've been good with the leftover raspberry curd from the cake of great epic-ness. I can feel the weekend pancake ritual being re-instated very shortly. Grate the zest from the oranges and set aside, and then squeeze the juiceinto a measuring jug and make it up to 100ml with milk. Measure the flour, baking powder, sugar and orange zest into a mixing bowl. Make a well in the centre and add the egg and half the orange juice and milk mixture. Beat well to make a smooth, thick batter and then beat in enough of the remaining orange juice and milk to give a batter the consistency of thick cream. Spray a frying pan with spray oil and then heat over a medium flame. Drop desertspoonfuls of mixture into the hot pan. When the top starts to bubble, use a palette knife to flip them over and cook for a further thirty seconds. Transfer to a plate and cover with a clean tea towel to keep warm and soft while you cook the remaining pancakes. Serve with butter, golden syrup, maple syrup or a fruit curd. Nothing like a good pancake, the orange sauce is an interesting accompaniment, making it a bit more special.